A value packed box of cloth diapering essentials with everything you need to start using cloth diapers now! Introducing the ORGANIC COTTON DIAPER KIT, a value packed box of cloth diapering essentials with everything you need to start using cloth diapers now! You don’t need to be cloth diaper savvy in order to appreciate it - but if you are, you will REALLY love our beautiful new boxed kit! We have put together an economical, easy and environmentally friendly starter kit that completely removes the guesswork from choosing a cloth diaper system. Our luxurious Organic Cotton Prefolds are such a truly economical cloth diaper system that you can start diapering right away without a big outlay of cash. Flushable liners and our step by step guide to no-fuss cloth diapering make it easy for you. No rinsing, no pins, no stuffing and no big deal to wash this cloth diaper system! AND you can call our toll free help line any time with questions. After 20 years of selling reusable cloth diaper systems, we are very good at helping parents succeed at and enjoy cloth diapering. 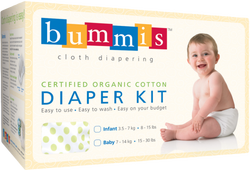 And the bottom line is that organic cotton diapers are truly the greenest choice in diapering. From the growing and harvesting of the cotton itself to what actually touches baby’s skin, organic cotton is simply the best! Safer for growers, workers and baby and …. this beautiful planet earth. This deluxe cloth diapering system in its bright and pretty box is so tempting and so practical too that you will not be able to resist taking it home – for your own baby, your grandchild, or as a shower gift!